On Tuesday, 10 April, officers from the local SAPS arrested three individuals for possession of dagga and two were also illegal immigrants. CAS 116/04/2018 was opened after Sergeant N.P. Mndebele conducted a stopand- search operation on the N2, en route to Iswepe, at around 08:25. 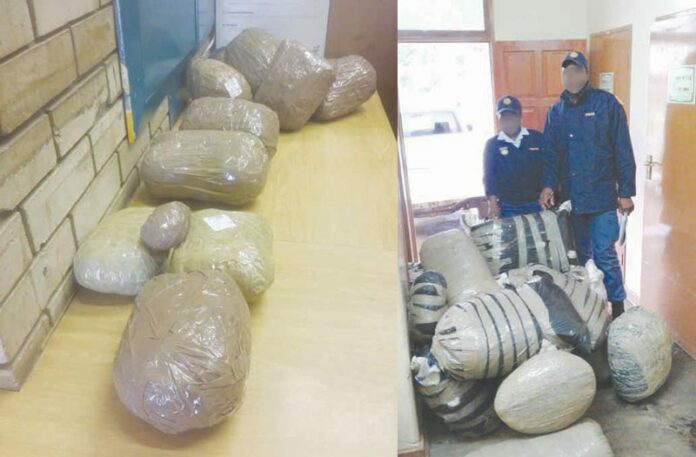 A 26- year old suspect was stopped and his vehicle searched when the officer found three rolls of dagga, weighing about 2 kg and valued at R3 000-00. The man was immediately arrested and his vehicle was seized. During the same operation, CAS 117/04/2018 was opened by Constable Lunga after he arrested another suspect. The man’s vehicle was searched and the officer found 1 kg of dagga, valued at approximately R2 000-00. His vehicle was also seized and he was apprehended on the scene. Constable Ncube also arrested a 27- year old suspect during this operation and CAS 119/04/2018 was opened. The suspect’s vehicle was searched and the officers confiscated 2,6 kg of dagga – street value of about R4 000-00. The man was arrested and his vehicle was impounded. Keep up the hard work and thank you for keeping drug dealers off Mkhondo’s streets, time and time again!